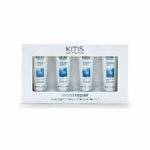 KMS Moisture Repair Overnight Massage Cream20ml. Time released leave-on mask. Deeply hydrates and nurtures dry or damaged hair overnight. Easy to apply on dried hair. Notify me of updates to KMS Moisture Repair Overnight Massage Cream20ml.